I pinned this activity to my Pinterest board a while back and it had TONS of re-pins. I'm intrigued...have many of you already done this? It seems simple enough and will work perfectly for reviewing our January and February songs! It will work with any or several songs for that matter! And since our snow here in Utah is quickly melting, I'm glad I've finally gotten around to this activity! Find my pin HERE which will take you to the website so you can download the pages (feel free to follow my Pinterest board while you are there if you like). The documents are free, but you must create a simple account in order to download it. I only printed the page you see above on white card stock. Then I laminated it so I can simply hang it on the chalkboard. **Want this activity even simpler? Just draw the above key on your chalkboard with chalk! Regular dice will work as well. For Senior primary, we will divide into teams - probably just down the middle of the room. I'll have 2 kids from each team come up to the chalkboard that will be divided in half with a chalk line drawn down the middle and 2 blank snowmen drawn on each half. The primary will sing and the 2 players will roll their die as many times as they can. After each roll, they must draw whatever corresponds to the key. For example, if they roll a 3, they will draw the snowman's buttons. If their next roll is a 2, they will draw the snowman's arms, etc. Speed being key :). Their goal will be to try to build a complete snowman before we finish the verse of our song and before their opponent. If they roll a repeat of any number they've already drawn, they will continue rolling. First player to draw a complete snowman will win that round. Once that round is completed, we'll erase everything, draw new blank snowman for each team then repeat with new kids, a new verse or the next song until we are out of time and all the kids have had a turn to come roll a snowman. I'll be watching for the best singers to come up next for a turn ;). Whenever we play as teams, I NEVER keep score. Sometimes the kids will, but I try to always just push it under the rug so we're all winners in the end. I've never had a problem with it. UPDATE: this variation with the Sr. Primary DID NOT work AT ALL! I was pretty frustrated. Everyone just wanted to watch the kids draw the snowmen. So I ended up doing the same thing as Jr. except we kept the teams. Our Bishopric happened to be in primary that day so they stood at the front and watched for the best singers from each team to come up. It worked MUCH better! For Junior, there will be no teams and I'll have several blank snowman on the board (maybe 4 to 6). We'll sing a verse and as we sing, I'll be watching for great singers to come roll a die and draw on the board ;). I'll have 2 to 4 kids at a time roll after each song/verse (just depending on how fast we are getting through everyone) and they will come draw what they rolled on the board on a snowman. Then I'll repeat with more verses/songs, new kids rolling until all our snowmen are filled in, everyone has had a chance to draw on the board and we've sung our songs a million times over! Easy! Just the way I like it!! For larger primaries, I'd suggest competing by class. 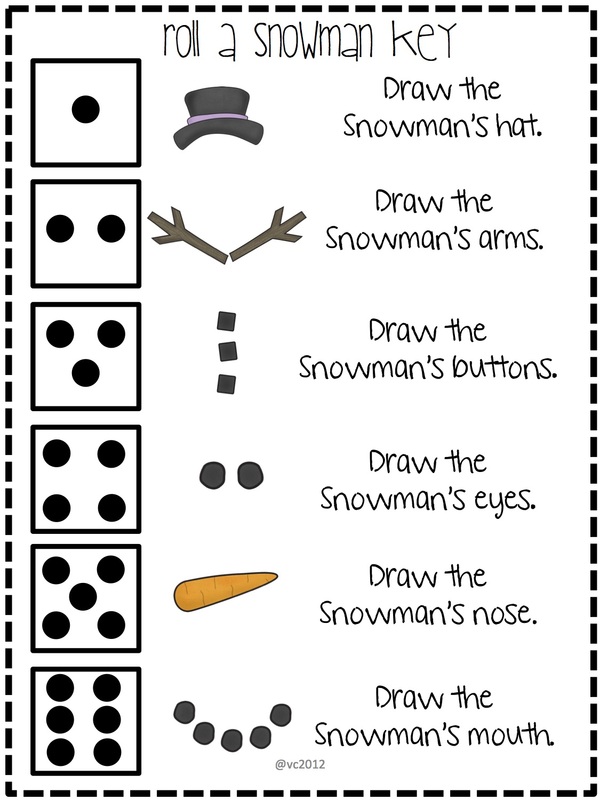 Each child receives a blank snowman sheet from the link above. As you sing, a class member gets to roll and draw their snowman in their seat (they can turn around in their seat as they roll and draw). Then continue on repeating with new children and new songs/verses. First child to finish their snowman wins that round. Thanks Camille! My junior primary kids will love this!